Photograph shows interior view of Dominion Bridge Company during World War 2 munitions retooling, workmen and machinery in shot. Date of photograph is approximate, ca. 1940. 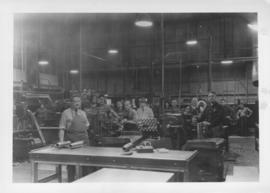 Photograph shows interior view of Dominion Bridge Company during World War 2 munitions retooling, man (possibly Bert Lug?) standing beside finished shell cases on carts. Date of photograph is approximate, ca. 1940. Photograph shows Dominion Bridge Company during World 2 munitions retooling, Time Keeper McWee, Machine Shop Foreman Bert Lug (or Lub? ), and Plant Manager William Albert Daum posing for shot. Date of photograph is approximate, ca. 1940. Photograph shows interior view of Dominion Bridge Company during World War 2 munitions retooling, workmen standing by shell cases and machinery in shot. Date of photograph is approximate, ca. 1940.